The Udzungwa Mountains is a vast (over 16,000 km2) mountainous range partially covered in rain forest. 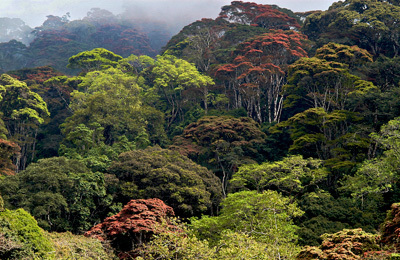 The altitudinal gradient of forest cover is unique and spans in some forests from 300 to over 2000 m a.s.l. About 1/5 of the area is protected as Udzungwa Mountains National Park while other important forests are protected as Kilombero Nature Reserve, Uzunwga Scarp Nature Reserve and a number of smaller Forest Reserves. The area holds exceptional levels of biodiversity and represents the largest and biologically richest block of the Eastern Arc Mountains, which is well known as one of the most important biodiversity hotspots on earth. The Udzungwas are exceptional importance for primate diversity and conservation, holding two endemic primate species, the Udzungwa red colobus (Procolobus gordonorum) and the Sanje mangabey (Cercocebus sanjei), both IUCN Endangered, and one near-endemic genus and species, the kipunji (Rungwecebus kipunji), IUCN Critically Endangered. In addition, at least nine other species of primates are present in the Udzungwas, including six nocturnal primates (galagos). Among the vertebrates, the Udzungwas hold 46 Eastern Arc endemic species of which 20 are Udzungwa-endemic, and 36 species of Eastern Arc endemic and near-endemic trees. These are among the highest scores for all sites in the Eastern Arc Mountains. A number of new, unique vertebrate species have been discovered in the last 15 years, including the aforementioned kipunji, the Udzungwa forest partridge Xenoperdix udzungwensis, the rufous-winged sunbird Cinnyris rufipennis, the shrew Congosorex phillipsorum, the giant sengi, or elephant-shrew Rhynchocyon udzungwensis, and several amphibians and reptiles. A unique community of forest antelope has been studied in recent years and includes the largest population of the Tanzanian endemic and IUCN-Endangered Abbott’s duiker Cephalophus spadix, one of Africa’s rarest duiker. The Udzungwas provide invaluable ecosystem services to the local and national economy. Specifically, through water catchment and consequent hydro-electric production, Udzungwas produce one-third of the electricity in Tanzania.